The UK continues to exhibit large disparities in power and representation between men and women. Gender inequality exists within the context of overlapping areas of social, political, professional and economic life. Only a systemic approach offers any hope of tackling the issue. Nicola Lacey of the LSE’s Commission on Gender, Inequality and Power shares findings from the final report, and recommends that quotas as well as other specific policies should be instituted in order that we see meaningful process. 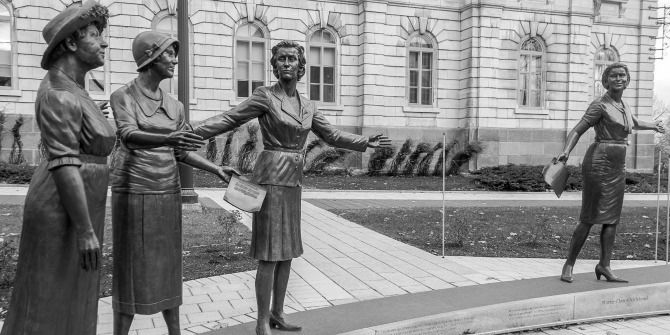 This piece originally appeared on Democratic Audit and is part of a wider series on Women in Academia and coincides with LSE Women: making history – a campaign in celebration of #LSEwomen past, present and future. The LSE Commission on Gender, Inequality and Power began its inquiry in the autumn of 2014: almost a century since the full admission of women to the legal profession; almost 90 years after the extension of the right to vote to all women; nearly half a century after implementation of equal pay and anti-discrimination legislation; and at a time of increasing female participation in the labour market. Despite these political landmarks, persisting inequalities between women and men, largely to the disadvantage of women, in the media, in the economic sphere, in political life, in the legal profession convinced us of the importance of undertaking our Commission. But readers may wonder what yet another report can add to the many recent analyses of gender inequality, and strategies for countering it, produced by a wide range of governmental and non-governmental organisations. In our report, we draw extensively on this existing body of work, as well as on academic literature which analyses the causes and effects of, and the possible solutions to, gender-based inequalities of position and power. But our approach is distinctive in drawing links between the different forms of gender inequality and operations of gender-based power across four of the most important sectors of our social system: the economy, the political sphere, the legal system and the world of media and communications. For the social forces which shape persisting gender inequalities do not operate independently within different sectors: rather, power imbalances which affect the position of women and men in one sector standardly affect their opportunities, status or position in others. The economic inequalities which persist in the labour market and the distribution of income, for example, curtail opportunities for women in the political sphere and within the law; the persisting inequalities and biases in the representation of women in the media and culture affect the opportunities of and attitudes to women in other spheres; the inadequate design or implementation of legal provisions shapes the status and opportunities of women in economic life; and so on. For these reasons, only a systemic approach offers any hope of tackling inequality. Gender inequalities of course persist in fields other than those we considered. To take just two examples, inequalities in the education system have long-lasting effects in virtually every other sphere of life, while gender inequalities in the provision of health care seep into life chances and the quality of life across the spectrum of social life. We have tried to capture the inter-relationships between gender inequalities in different social spheres by weaving through our sector-based analysis four cross-cutting themes: those of power, rights, work-life balance and gender-based violence. For example, while gender-based violence might be thought to be a concern primarily of the law, we show the ways in which gender inequality in the political sphere dilutes the will to identify the relevant issues or to tackle gender-based violence; the ways in which media representations enact and normalise certain forms of gender-based violence and how policies have reduced funds for refuges from gender based violence despite analysis that shows how this violence generates significant costs to the economy in addition to the harm borne by women. We also show the way in which power in the media, the economy and the political system shape the relative worth of rights formally established by the legal system to differently situated women and men. And we show the ways in which the structure of gender relations – in particular, the unequal distribution of responsibility for the care of children and of the elderly – creates dilemmas of work-life balance which are detrimental to women’s quality of life, and to women’s life chances, across social spheres. So while our report is structured around four main sections corresponding to the economy, the political system, law and the media, the intersecting themes run all the way through the report. Our effort to set questions of gender inequality within the context of overlapping areas of social, political, professional and economic life constitutes one form of what social scientists have called intersectionality: in other words, the insight that social outcomes such as gendered inequalities are produced by multiple intersecting forces such as ethnicity, wealth and educational and social status, migration status, sexuality, age, care responsibilities, marital status. We point for example to the differential impact of recent social, welfare and labour market policies on poor women, on women with caring responsibilities, on single mothers, and on women from certain ethnic minority groups; to the lower worth of legal protections against violence to those with insecure migration status; to the differential impact of implicit biases in the media on older women and women from particular social groups. Our inquiry also revealed the decisive impact on gender relations of the economic crisis of 2008 and of the austerity policies which it has brought in its wake. Both the disproportionate impact of austerity on women, and more generally the (in our view, and that of most of our participants) unfortunate tendency for social and professional life to be organised to an ever greater extent around unconstrained commercial or market logics which purportedly undermine collective or redistributive policy initiatives as contrary to the demands of efficiency. These trends have increased the degree of polarisation among women, potentially weakening the basis for pro-gender-equality political alliances. While countering this social trend, and insisting on the importance of couching policies on gender equality in terms of fairness, equity and social justice, we also criticise many of the claims about the efficiency of current gender arrangements as themselves founded in implicit biases, false assumptions, and unimaginative short term analysis. In a world in which ‘everyday sexism’ remains rife, gender discrimination presents special challenges. We argue that in many fields – notably political representation – progress will require the implementation of quotas: a controversial recommendation which presents both political and legal dilemmas. But we also found it possible to identify existing arrangements, or realistic proposals (including those of the Leveson Report), which have real potential to effect improvements. Across the spheres, we recommended specific policies of gender auditing, gender mainstreaming and gender awareness training – as well as more effective use of existing mechanisms such as the equality legislation: we also made some more radical proposals for the establishment of a National Care Commission, for the reversal of legal aid cuts and for the reassessment of criteria of merit which are too often taken uncritically for granted in recruitment and promotion decisions. We trust that, along with other recent or current reports such as the Equality and Diversity Forum’s Beyond 2015: Shaping the Future of Equality, Human Rights and Social Justice and the gender pay gap inquiry launched by the Women and Equalities select committee, our report will contribute to a renewed phase of not only debate but action to counter gender inequality. Nicola Lacey is School Professor of Law, Gender and Social Policy at the London School of Economics (LSE), attached to the Departments of Law and Social Policy and to the Gender Institute.